Multiple factors have motivated firms to engage in ESG analysis within the investment framework. London, 28 November 2018 – Environmental, social, and governance strategies have emerged over the past decade within the global investment landscape and have seen increasing adoption. Overall, individual firms’ approaches can vary significantly, along with the extent to which investment analysis is performed. But there is a growing recognition that ESG factors can be material to investment performance, as well as risk, and that integrating such factors into the investment process aligns with a long-term investment horizon. In this report, the first in a series of reports on ESG integration, Aite Group explores how buy-side firms have integrated ESG strategies into their investment framework and the challenges they have faced. 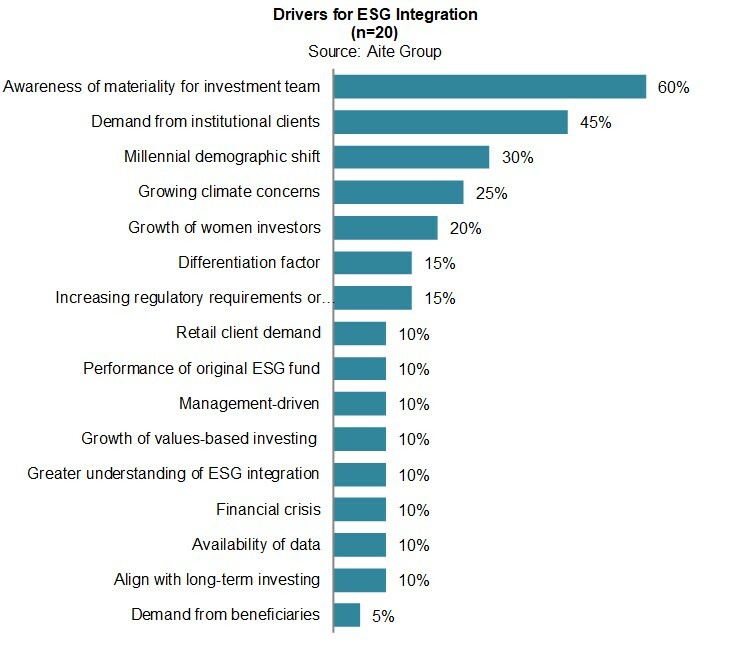 Based on 24 Aite Group interviews conducted with buy-side market participants between September and November 2018, it overviews the various constituent organizations within the ESG landscape as well as the ways financial institutions are interacting with ESG data and third-party data providers. This 45-page Impact Report contains 23 figures and two tables. Clients of Aite Group’s Institutional Securities & Investments service can download this report, the corresponding charts, and the Executive Impact Deck. This report mentions Bloomberg, ISS, Morningstar, MSCI, Refinitiv, RobecoSAM, S&P Dow Jones, State Street, Truvalue Labs, and Vigeo Eiris.